I FINALLY convinced Raj to take me to Petra. He’s been telling me for the past three months that it’s too hot and we’d go…later…With nothing to do and nowhere to go NOW, we finally made it happen this weekend. 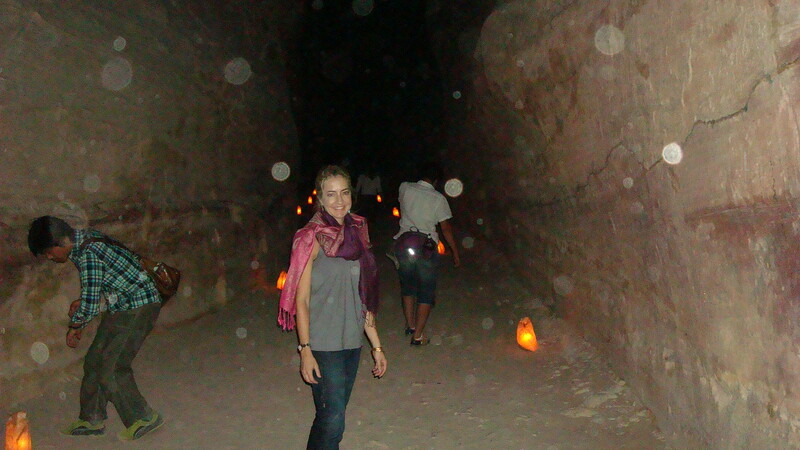 I was insistent that we go during the week because I really wanted to see “Petra by Night,” an after-dark guided excursion through the canyon (only offered three times a week, Monday, Wednesday & Thursday), lit only by candles (luminaries). Keep in mind, this is no “Lights of Liberty” tour where you have to wear headphones while emotive music is played to enhance your experience as you’re walking through historic sites, nor is it a pre-recorded, laser light extravaganza like the kind you see at the Mayan Pyramids in Mexico where a booming voice recounts the glories of the past while lasers and sound effects pollute the night sky. 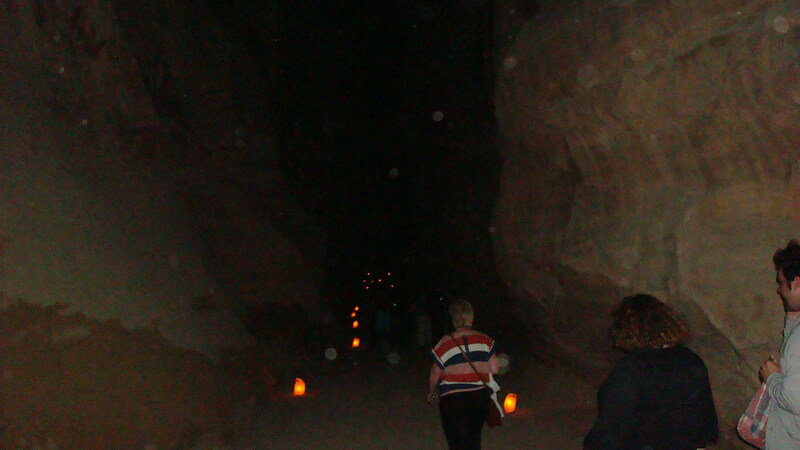 I found Petra by Night to be an amazing experience precisely for its lack of pomp and commercialism. The gates open at 8:30 and you’re welcomed into the main gate. The walk takes about twenty minutes, mostly in silence if you’re lucky enough to be in the right company, which enhances the experience. It takes a little while for your eyes to adjust, but once they do, the night sky and the shadows flickering off the canyon walls are magical. When you finally reach the Treasury plaza (best known as the temple from Indiana Jones and the Last Crusade), the facade of the Treasury is illuminated from hundreds of candles in the sand. 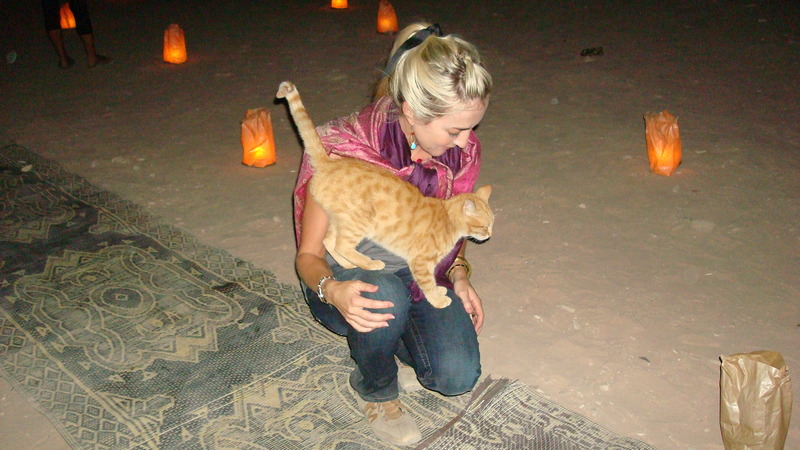 A guide seats you, either onto carpet on the sand in front of the plaza, or on a bench along the canyon wall, and then everyone is served Bedouin tea. 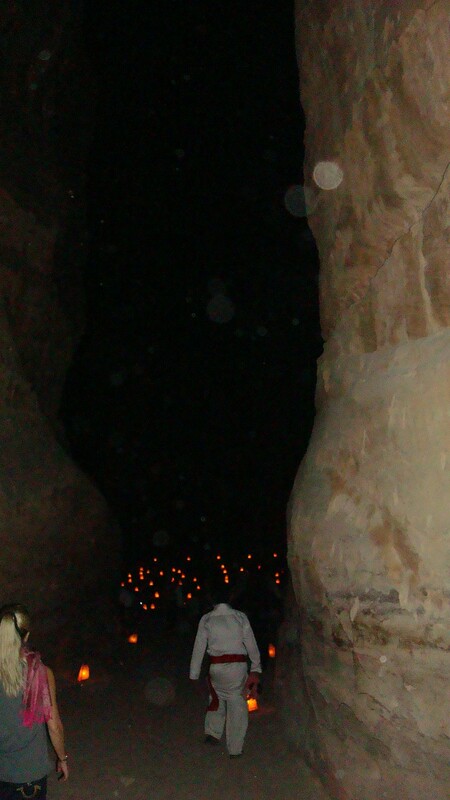 Once everyone is seated, a Bedouin musician sings a folk song, followed by a another one on a pipe, and then a little bit of history is recounted by a guide. The whole “show” lasts approximately 45 minutes, just the right amount of time without making it too long or too short. 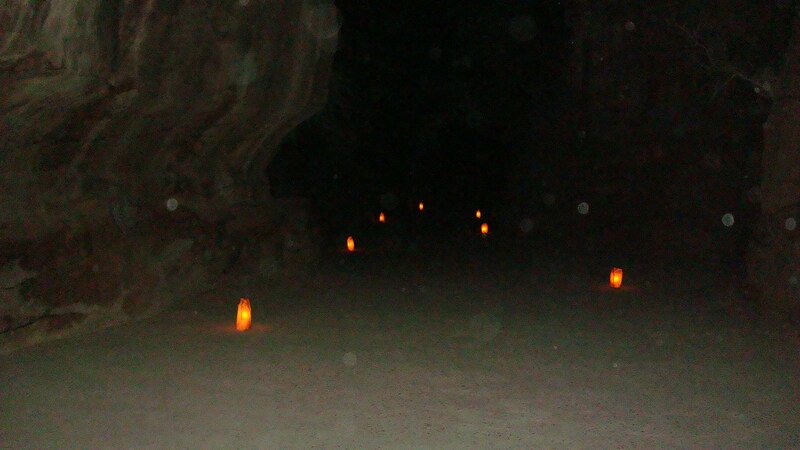 Guests are invited to linger a little longer, and then walk back out along the candle lit path, back to the entrance. We finally made it to Citadel Hill! This was our second attempt (after getting horribly lost the last time) in one month. 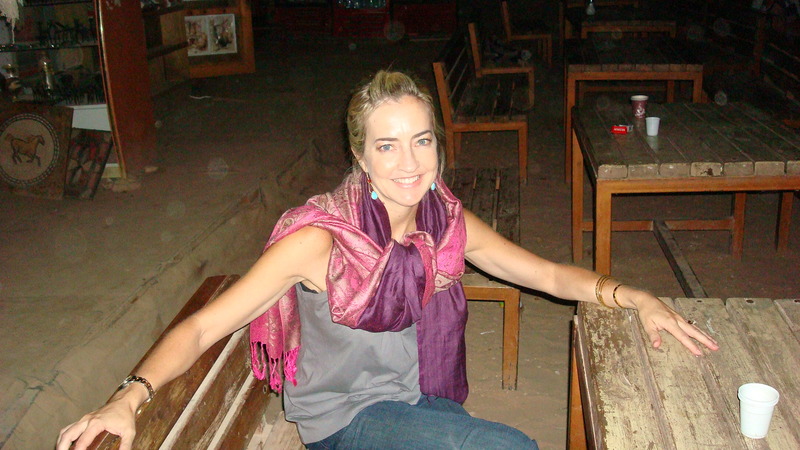 It was no easy feat either; we had to go through City Center, the flea market area, which was more happening than normal. I saw fake Louis Vuitton’s on the street too, if anyone’s interested. Citadel Hill, or Jebel al-Qal’a has been a happening place since the Paleolithic Age (that’s 18,000 years in case you don’t know your ages–I had to look it up). When the Romans moved in, they cleared away previous civilizations by chucking stuff over the hills, leaving heaps of archaeological booty. 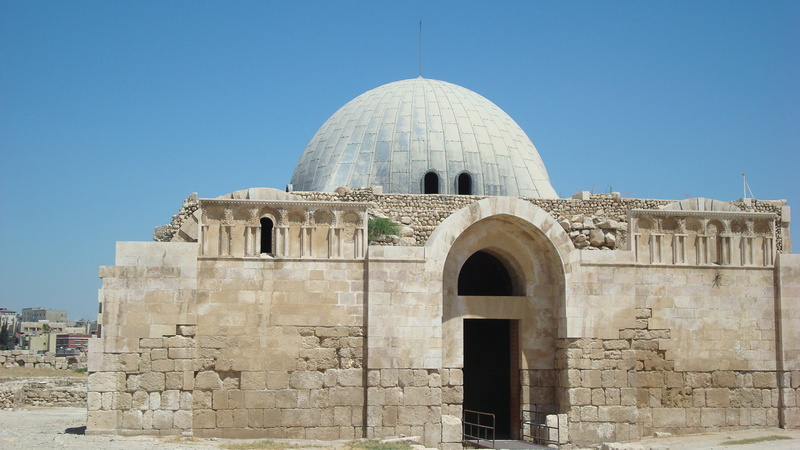 The two main features of the Citadel include the Temple of Hercules and the Umayyad Palace. 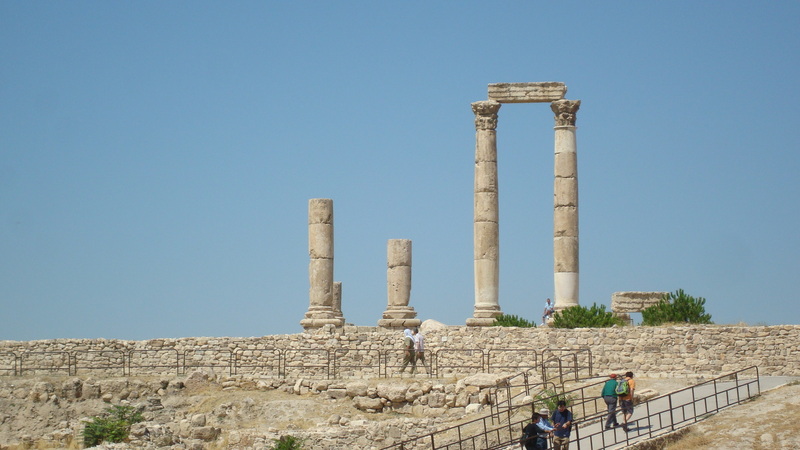 The Temple of Hercules was built around the same time as the Roman Theater (across the hill). Remember when that was? Didn’t you read my post? 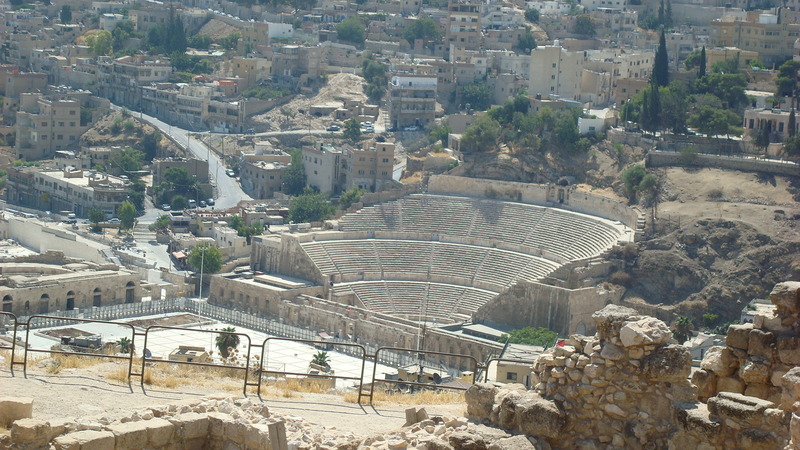 [It was built between 169 and 177 AD]. 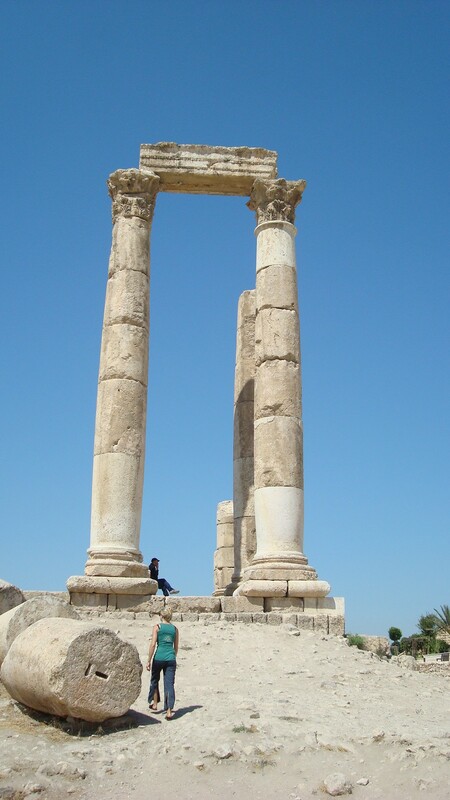 The columns were re-erected in 1993 and lead to the inner sanctum (a.k.a. the cella). 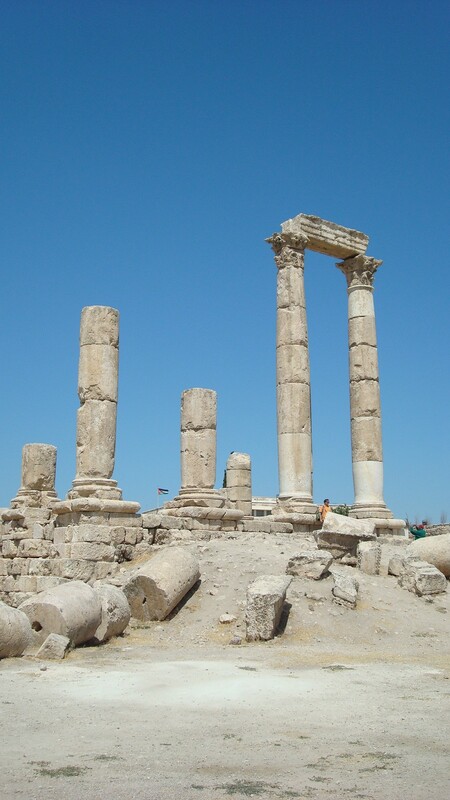 Within the inner sanctum, there’s a patch of bare, exposed rock believed to be ‘sacred rock’ that formed the centerpiece of the 9th century BC Ammonite Temple of Milcom. The dedication to Hercules isn’t really known, but due to the large amount of coins with images of Hercules, they believe it’s all in his honor. 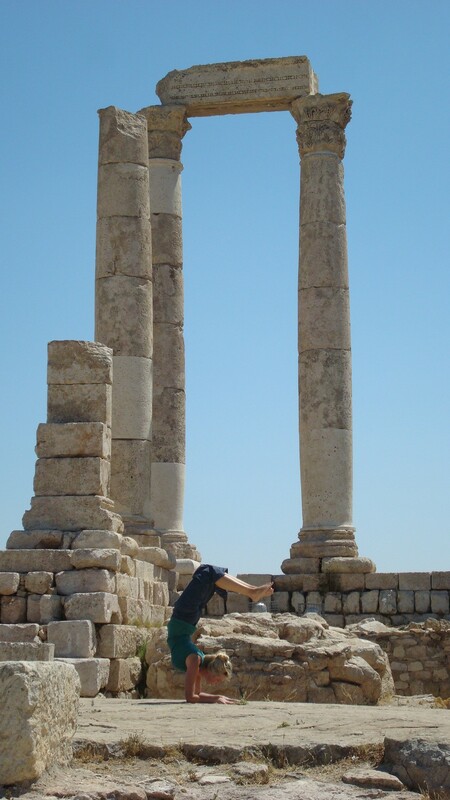 You can see how massive the columns are in relation to me. 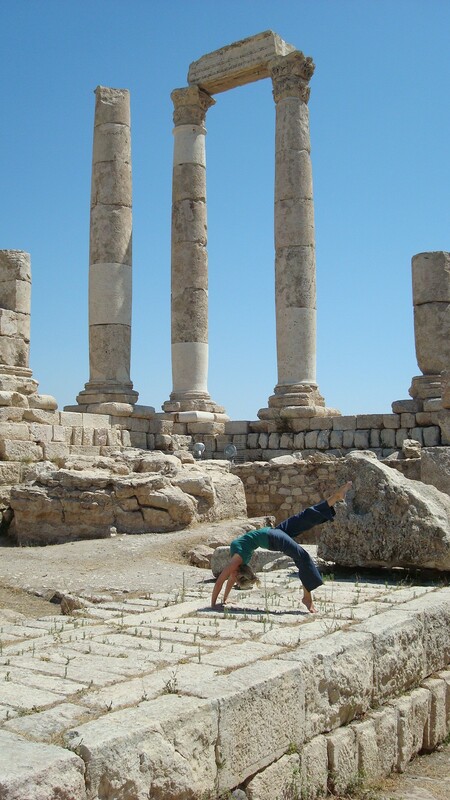 No trip to ruins would be complete without a few yoga graffiti poses to which I have to thank Raj, the photographer. Don’t think I’m the only obnoxious yogi who does this either! As it turns out, there was a guy traveling alone who asked us if we could take a few pictures of him meditating, which we gladly did. He’s a yoga instructor from Mexico. 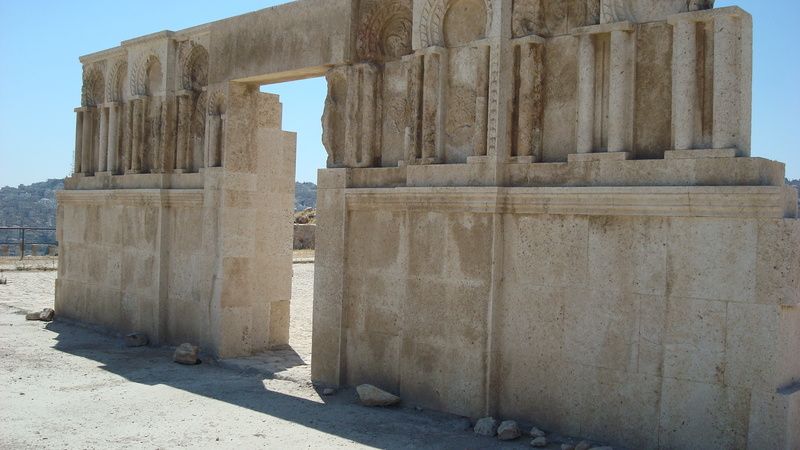 Beyond the Temple of Hercules are the ruins of a small Byzantine church, in front of which stands the Umayyad Palace. 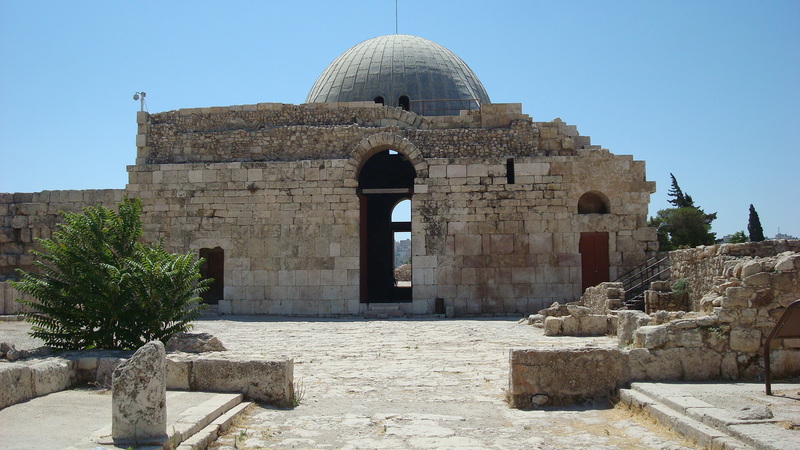 The palace was built over the remains of a pre-existing Byzantine building, which is why it’s in the shape of a cross. There’s a dome on top of the palace, which is rife with controversy as to whether or not it’s historically accurate or if there ever was a dome on top. 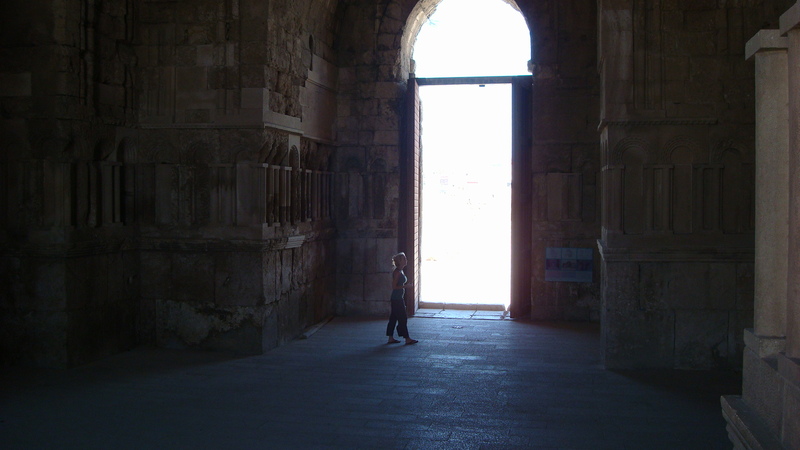 The interior of the palace is massive, much more so than you would expect from the exterior. As you exit the palace on the other side, opposite the entrance, you walk through a colonnaded street that leads to what are believed to have been administrative offices. There’s a museum up here as well that houses a collection of interesting artifacts found on the the site of Citadel Hill. 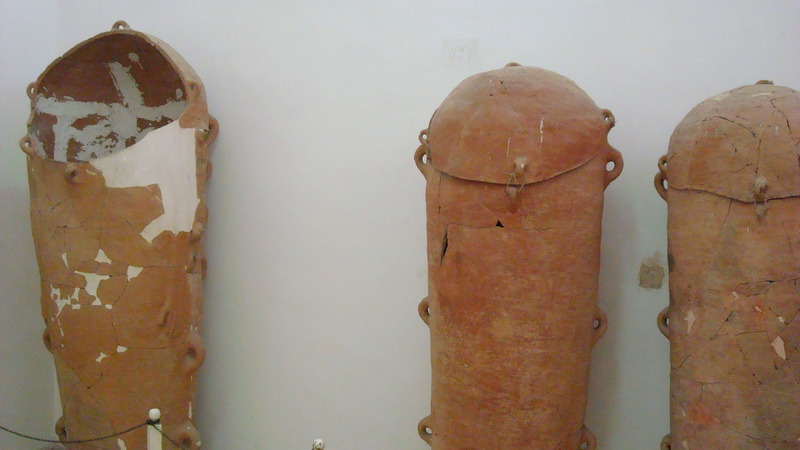 I found these ‘pod’ shaped coffins to be the highlight of the collection. I’ve never seen anything like them. They’re constructed of pottery and remind me of the pods from the movie Cocoon. Remember that movie? It was horrible, but I think they stole the idea from these pods.